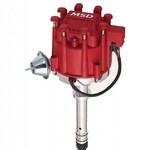 MSD Ignition first produced the after-market distributor, made from a billet of 6061-T6 aluminum. These Pro-Billet Distributors can now be purchased for the majority of popular domestic V8s, as well as for a number of other popular engines. There are several different versions of after-market distributors on offer. Some things are the same throughout the distributor line, like the seal design and upper ball bearing to guide the QPQ-coated shaft and the pickup that is non-magnetic, but several lines are also designed to suit different specific applications. This is our classic distributor and accounts for the majority of our distributor line. This is the most popular model, requiring an MSD Ignition Control like the 6AL or 7AL-2 Ignition Control. This distributor features a 2-pin connector that connects directly with an MSD Ignition. Our classic distributors are available for engines ranging from AMC to the famous W-Chevy motor. The whole range is covered, from muscular street cars to full-on racers. Some of these distributors are built with vacuum advance; others might be locked out. It is key to know that an MSD Ignition Control is needed. This can be identified by the 2-pin connector. MSD also sells the Ready-to-Run range of distributors. The first difference you see is that instead of the 2-pin connector, the distributor has a Weathertight connector with 3 pins. Ready-to-Run distributors feature a built-in ignition module, so no MSD Ignition Control is needed. These are easy to drop in and connect by means of three wires (power, ground and coil negative), which is part of why they are so loved for street rods and muscle cars. These distributors have a grey tach output wire to serve a tachometer or an after-market EFI system, like the Atomic EFI. In addition, an adjustable rev limiter is now available! As you might guess, these Pro-Billet Distributors need a crank trigger to fire the ignition. These distributors focus on doing only that: distributing the spark. These have no advance and no trigger mechanism. They are intended to be high-performance racing distributors. These can be identified easily by the absence of wiring and the lower stance.